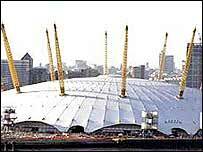 More than 700 homeless people have been given shelter in the Millennium Dome over the festive period so far. Homeless charity Crisis is hailing as a success its annual Open Christmas campaign, held at the south-east London venue for the first time. Around 4,000 volunteers have helped with setting up as well as running the shelter at the Dome. The charity says more are needed for the clear-up when the eight-day scheme ends on 30 December. Shaks Gosh, chief executive of Crisis, told BBC News the impressive look of the Dome had made this year's campaign special for homeless people who feel particularly alone at this time of year. She said: "I think perhaps the most important thing has been the wow factor. "Homeless people have arrived and have seen this big, wonderful, modern building and I think their overwhelming sense is this is such a fantastic thing and it's for them. "Because it's such a wonderful space it's been possible to do all kinds of things we wouldn't have otherwise been able to do. "We've been having classes and having quite a lot of Christmas fun." The Dome has hosted a midnight mass and performances by bands. Homeless people have been given clean clothes, a haircut in a salon at the venue and healthy meals. Ms Gosh said as the scheme came to an end the emphasis was now on helping people find more permanent accommodation. The Dome is one of six centres which have been used by the charity to help a total of 1,000 people across London over the holidays.